What: Hamilton-based garage-rocking power trio who released their second album Stay Young – always solid advice – last Fall. The first video from it made the inaugural shortlist for the Prism Prize, created to recognize the best music video in Canada. 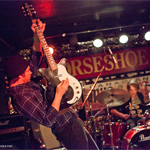 Why: They just showcased their goods last month at Canadian Musicfest, and are now playing this “J.D. Presents” showcase before embarking on a Spring European tour. How: Tickets for the show are $10 in advance but courtesy of LiveNation, I’ve got a pair of passes to give away for the show. To enter, email me at contests AT chromewaves.net with “I want Young Rival” in the subject line and your full name in the body, and have that in to me by midnight, April 15.